Lamb is a good source of protein, haem-iron and B group vitamins which is perfect for our body repair and ideal for athletes and growing children. 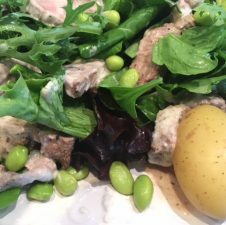 In this recipe the lamb is served warm with lettuce greens and new potatoes but can be equally good served cold making this an ideal meal for someone running late home from work, school or sports practice. Place the backstraps of lamb on a grilling tray, spray both sides with oil and sprinkle over the Moroccan spice. Grill the lamb fillets for 5 minutes each side ( or 6 minutes if you prefer the meat well cooked) Set the meat aside for a further 5 minutes to rest before slicing it thinly. Pour the Tzatziki into a shallow bowl, toss the lamb in this and then arrange the coated meat on top of the greens. Spoon any excess Tzatziki over the meat if you wish. Arrange the boiled potatoes, and Edamame beans around the platter, squeeze the lemon over the food and serve. Each serving contains: Energy 950kJ/ 226 kcals; Protein 25g; Fat 4.4g; Saturated fat 2.3g; Carbohydrate 18.5g; Sugar 2.6g; Dietary fibre 4.3g; Sodium 192mg. This recipe is also great using grilled chicken breasts, pork or smoked fish in place of the lamb. This recipe can also be used to make Souvlakis. Just spread some Humus on Pita or Naan Bread, then top with the meat and salad and roll up.